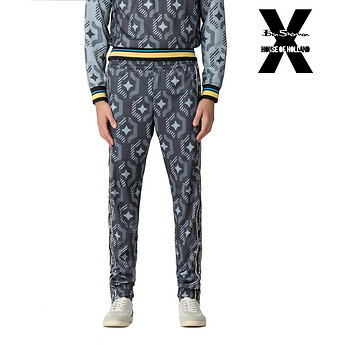 From the Ben Sherman x House of Holland collection, the Geo Wallpaper Digitally Printed Tracksuit Pants feature a blue vintage-inspired geometric print inspired by a classic retro-cool wallpaper design. 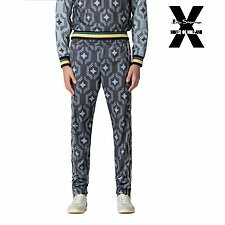 More detailing includes a black-and-white Ben Sherman logo along the outer seam and yellow-and-blue accents on the waistband. This AW19 Ben Sherman has collaborated with acclaimed British designer, Henry Holland. Holland is renowned for his daring, quirky designs with a nod to British subcultures, and was, therefore, the perfect person to team up with for the brand. Holland has infused his signature creative flair into a selection of classic Ben Sherman silhouettes to create a dynamic range that proudly represents the best of London’s street-style, combining a modern sartorialist twist with a rebellious spirit.